This is an addendum to Part 3 of the series of articles on the basic structure of Hindi poetry. That part dealt with the role and importance of rhythm in Free Verse (Mukt-Kavita). 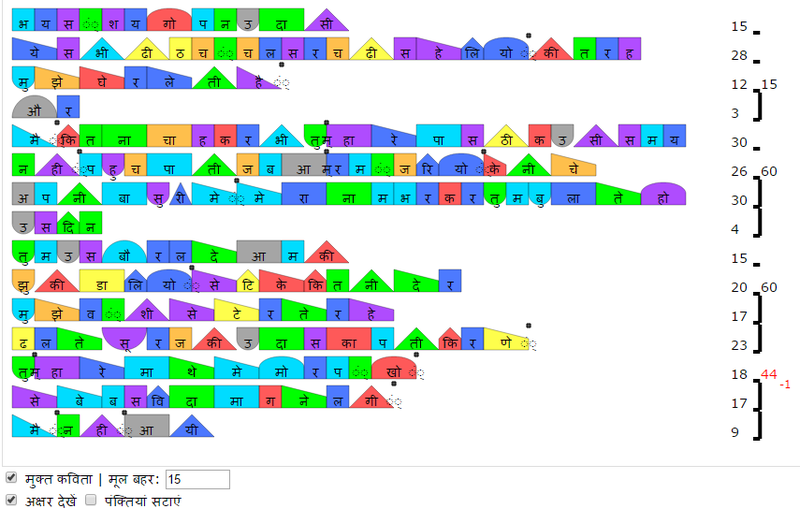 Also, Part 2a illustrated the use of GeetGatiroop, a powerful software tool, for analyzing and visualizing the rhythm of a Hindipoem. This tool, developed by Vani Murarka, is available at http://manaskriti.com/geet-gatiroop/. Subsequent to the publication of Part 3, some features have been added to GeetGatiroop that should be especially useful for analyzing rhythm in Mukt-Kavita. This addendum illustrates the use of the new version of GeetGatiroop by applying it to the same examples of Mukt-Kavita that were discussed in Part 3. Such an analysis should help a reader in understanding the inherent rhythm in Mukt-Kavita. This should be of particular interest to poets as well as scholars and enthusiasts of poetry. Finally, GeetGatiroop should prove to be a valuable tool for modern musicians interested in setting Mukt-Kavita to tune. Part 2: Maatraa (मात्रा) or Meter of a Poem for Chhanddobaddh (छन्दोबद्ध) Poetry - i.e. poems that follow a clear rhythm. These are perhaps the most important ingredients of the craft of poetry. 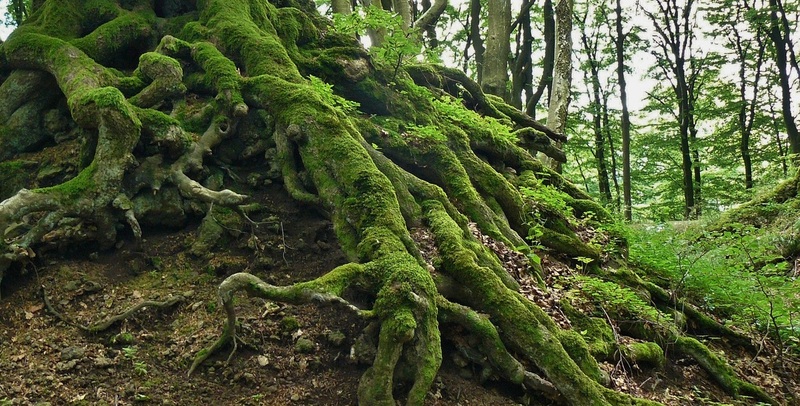 Part 3: Rhythm in Mukt-Kavita (free verse) based on Maatraa and other structures. Part 3a: (This part) Updates to software GeetGatiroop to support Mukt-Kavita. In this part (addendum) we will give an overview of how the software GeetGatiroop can be used to perform the analysis of rhythm in Mukt-Kavita as explained in Part 3. As we have emphasized repeatedly in this article series, rhythm, periodicity, or laya (लय) is a core characteristic of poetry that distinguishes it from prose. With the advent of new poetry, mukt-kavita, or free verse, it has become essential to ensure that a poem retains a certain basic rhythm, otherwise a poem will be just a piece of prose with breaks at arbitrary places of a sentence. The software "GeetGatiroop" should specifically serve this purpose and fulfill this important need for characterizing the base rhythm in free verse. For the purposes of precision and clarity, we are introducing a new term in this article and in the Geet Gatiroop software. The term is "मूल बहर". Mool-bahar is defined to be the measure of the basic periodicity and meter as per maatraa counting that is inherent in a free verse poem. Mool-bahar is not an established term in Hindi Kaavya-shaastra. There seems to be no specific word in Hindi that exactly specifies this characteristic of a poem possibly because in the classical craft of poetry most poems were metered verses adhering to the measures of laya, maatraa and meter. Comparatively, free verse is a more recent development in Hindi literature. 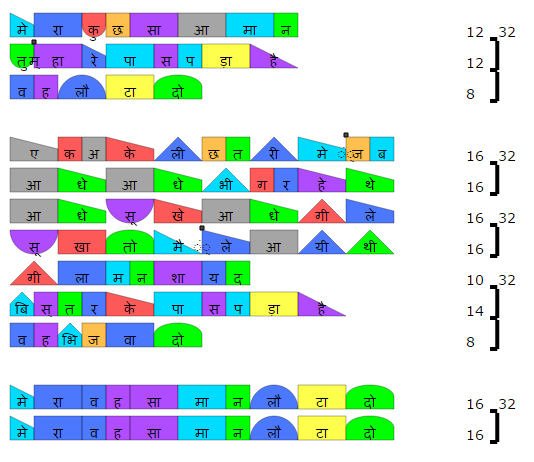 In a mukt-kavita that has an inherent rhythm, we had seen that the maatra structure of the poem adheres to a basic periodicity (or the mool-bahar as defined above) either completely or at least loosely. However, unlike conventional or chhandobaddh poems, the periodicity may be apparent only when a certain number of lines of the poem are considered together. 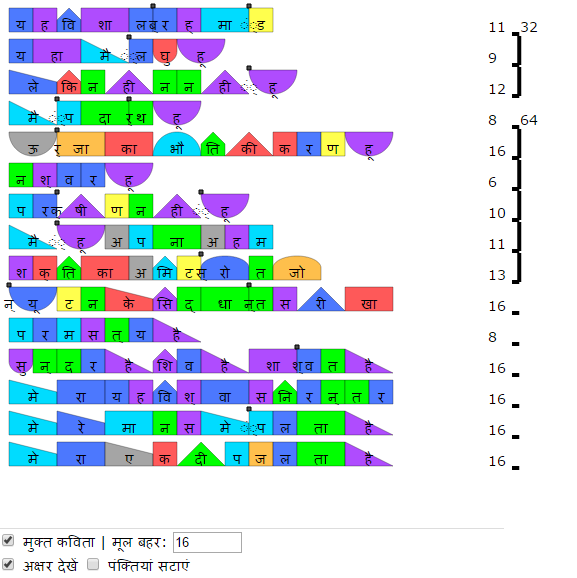 Thus, the GeetGatiroop software has been updated so that you may see the maatraa count of the lines in combination. Additionally, the user can specify the mool-bahar or basic periodicity in maatraa-count terms that the poem should follow. On specifying the mool-bahar, the software shows the extent to which lines are digressing from the base count. The poet can then use this information to modify the poem if required. This information is also useful for a musician in setting up the rhythm of the poem. The facility to adjust the maatraa allocation of long vowels (deergh swar) and half-letters based on pronunciation as described in the earlier articles of this series can be used for mukt-kavita too. Let us now see the specific steps to be carried out to use this free-verse feature of GeetGatiroop. For demonstration we are using these three lines from Dharmveer Bharati’s poem Kanupriya in the screen shots below. This portion of Kanupriya has been discussed in greater detail in the earlier part 3 and is also revisited in section 3 below. When you enter your poem in the GeetGatiroop box and press the “Visualize” button, some options show up below the visualization generated. To activate the Free-verse feature, click on the “Free-verse” checkbox (or मुक्त-कविता checkbox in the Hindi interface). 1. 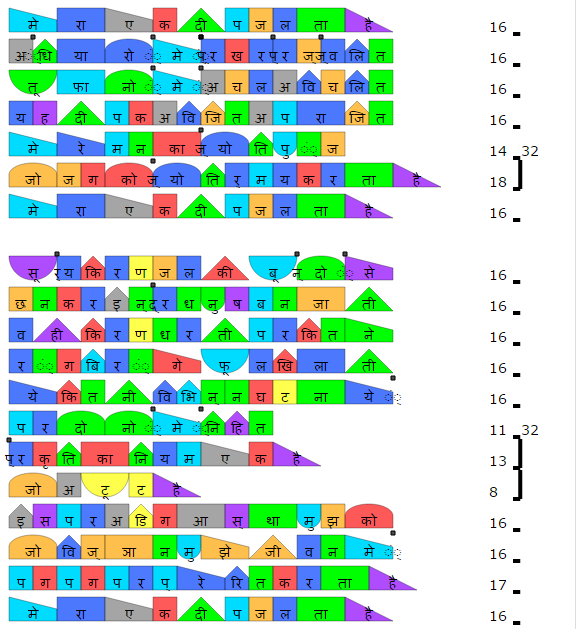 The software will show short thick black lines beside the maatraa count of every line of the poem. 2. The software will show a “Base Count” (or मूल बहर for Hindi interface) box. Clicking on the short dash beside the maatraa count of a line connects the line to the next one and we can see the composite maatraa count for the combined lines. For example, clicking the black line beside 18 and clicking the black line beside 17 gave this result, 18+17+9: 44. As discussed in Part 3, this portion of Dharmveer Bharti’s Kanupriya has a base meter of 15 maatraas. Giving 15 in the Base Count / मूल बहर tells us if the composite lines are in accordance with the basic periodicity of the poem or not. If there is a digression, the software gives the exact digression, whether the count is extra or lesser. Some digression is allowed in mukt-kavita as long as the overall sense of rhythm remains. In the example below, the lines are 1 short of 45 which would be a perfect multiple of 15. When we enter 15 in the Base Count / मूल बहर box the software shows this digression (-1), meaning that these lines are 1 maatraa short of the base meter. If the lines had been totally in accordance with the base-count / mool-bahar, the software would show the total of the composite lines in the normal black color. A digression is shown in red. To separate lines marked as composite, click on the vertical black line. This is the basic use of the GeetGatiroop software for mukt-kavita. The facility to adjust the maatraa allocation of long vowels (deergh swar) and half-letters as per pronunciation can be used for mukt-kavita too. As per this overview, let us see how the poems discussed in Part 3 will look in GeetGatiroop. We invite you to copy-paste your favorite mukt-kavita into GeetGatiroop and see it from a new perspective of rhythm. Explore whether you can identify how the lines are to be considered together so that a picture of basic periodicity emerges. In Part 4, we will talk about the structure of Urdu poetry.